It seems that the run of new Indian restaurants opening in Krakow is showing no sign of abating. The latest one to open its doors this year is Parampara, situated in Każimierz on ul. Starowiślna. 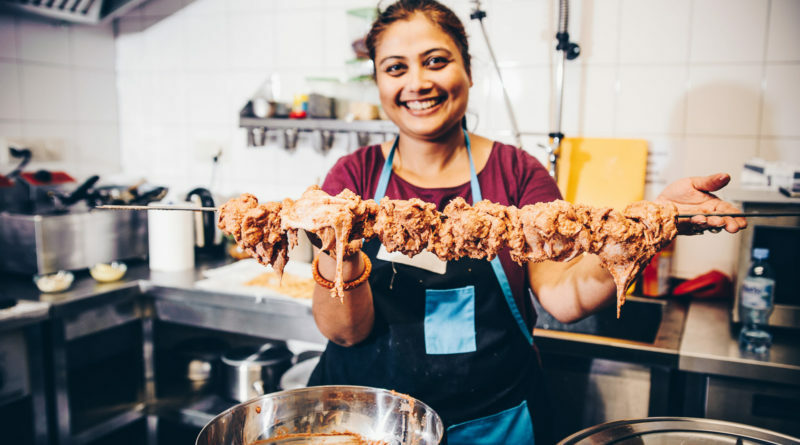 Its name means ‘tradition’ in Hindi, so I was curious if it lived up to its name – tradition being a pretty important thing in Indian cuisine (who other than Gaggan Annand has attempted ‘modern’ Indian cuisine successfully? ), and how it measures up to the competition. Friday night, 8pm – pretty quiet – no problem getting a seat here yet. To be fair, they are very newly opened, and the Indian restaurant market in town is, now, moderately fierce. First impressions are good. Tasteful decorations, fittings, and furnishings. Music at a low level, of the Hindi variety, a candle on a table floating in a small bowl of water with rose petals. Small details, but I like a restaurant that makes an effort. There are two rooms, one large ochre-coloured room with about twenty seats and six or seven tables, and another smaller room at the back, painted blue – both at ground level. There is a downstairs area also, but it’s not been renovated for use yet. The menu is refreshingly short (for an Indian at least) – six starters, 50/50 meat/vegetarian, and sixteen main dishes, six of which are vegetarian or vegan. For some, this would be a plus, for others a minus; speaking personally, it’s no bad thing as long as the dishes on offer are good. There’s a handy (presumably more for a Polish audience) guide to the heat of each curry – each dish is assigned a colour code – yellow, amber, or red, depending on spiciness. 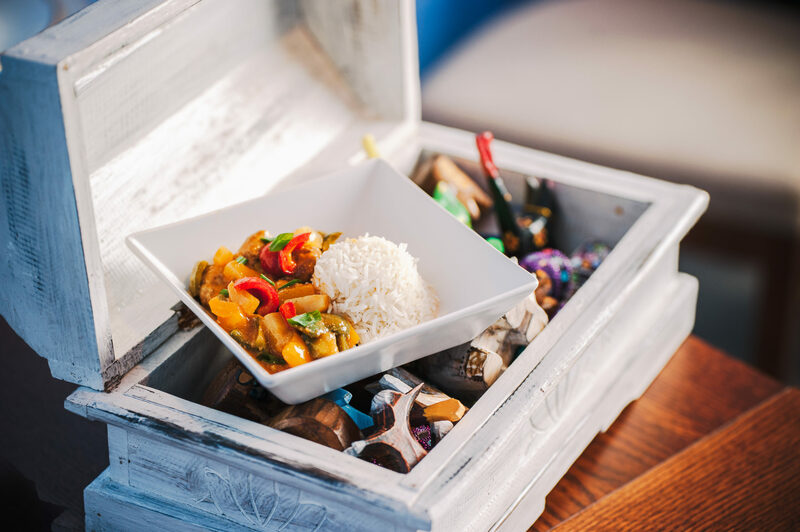 The drawback of this, as the menu makes clear, is that you cannot order your dish at a level of spiciness that suits you: a definite drawback in my book, as there is no reason a chef shouldn’t be able to tailor dishes accordingly. 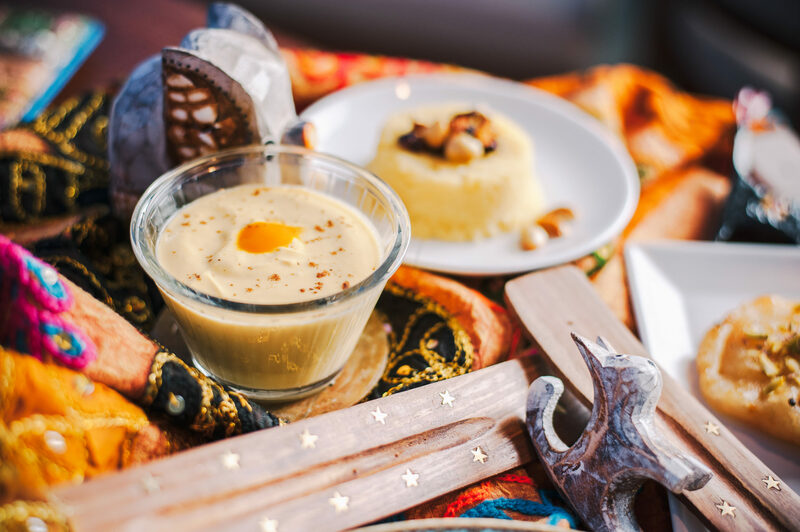 I ordered a mango lassi (10zł) from the helpful waitress to kick off with, and I had absolutely no complaints with it – thick, creamy, full of flavour and ice cold, as it should be – and sprinkled with crushed almonds. A beer quickly followed – there’s a reasonable selection, including a couple of Indian brands in bottles (Cobra and Kingfisher, both 11zł) and six types of local beer – Barbakan and Wawelskie (11-12zł), all bottled. There’s also a draft lager. The wine list, almost irrelevant as it is to any curry connoisseur, offers six types of European white and a couple of reds (75-100zł a bottle). I tried a wheat beer and it was satisfyingly cold and tasty. I decided on a fish dish for my starter (despite strong competition from lamb samosa and onion pakora), something called ‘Tawa fishfry’, which consisted of grilled cod with Indian herbs and fried bell pepper. Two squares of delicately-cooked and tender fish arrived, a reasonable portion for the 19zł price tag. I was pretty happy with the dish, which had a combination of flavours – ginger, garlic, lemon and chilli – coming through. It made a great starter, and would have been even tastier for me if it had been served with a side-dish of something like chutney. For my main, I ordered a lamb dish called ‘Laal Maas’ (35zł), which was promisingly accompanied by a red splodge on the menu, indicating maximum spiciness, and got basmati rice (8zł) with cumin, a garlic naan (10zł) and cucumber raita (5zł) to go with it. Literally meaning ‘red mutton’, Laal Maas is a meat curry from Rajasthan, India. Made from mutton or lamb, it’s prepared in a yoghurt sauce with hot spices such as red Mathania chillies, and also rich in garlic. The dish came in a traditional Indian metal pot (another detail which I like), after little waiting time. The lamb was very tender – not mutton, which can be chewy and tasteless. The sauce, rich and delicious, definitely had the requisite heat for me – I expect the hottest curries in Poland to be medium for me as a rule of thumb, and so it turned out here. That being said, you need to know this if you expect a UK-level hot curry. Suffice to say, I was mopping my brow eating this, so it was good enough for me. The creamy raita was a superb coolant. I hate a curry which is so hot that the heat drowns out all the other flavours anyway. There is a vindaloo dish on the menu – made from pork, interestingly – so it would be a litmus test to see the spice level of it. The rice that came with the curry was well-cooked and there was mountains of it, and the naan, crispy, buttery pillows of it, was piled up so much that I only got half way through it. I got a small dessert to finish off with – there being little room left despite the loosening of a belt notch – something called mango srikhard (12zł) which was basically a kind of mango mousse. It made a pleasant mouth-cleanser and a very satisfying conclusion to a more than acceptable meal, which came to almost exactly 100zł. For me, for a three course meal with two drinks, that represents very decent value. The majority of the mains come in at about 25-35zł, so a curry with rice won’t set you back more than about 50zł – the going rate in this town. The meal that I had was excellent, and on this showing I wholeheartedly recommend Parampara. I’d like to go back and test the vindaloo though, and see how spicy other ‘medium’ dishes such as the lamb kofta and pork ribs with ginger are. If there is going to be one major complaint about this restaurant – and I think there will be those who share it – it will be about the lack of ‘signature’ Indian dishes on the menu. Other than chicken tikka massala, there are few. No biryani, no dopiza, no jalfrezi, no rogan josh. If you look beyond that and try some slightly less well-known dishes, you might be pleasantly surprised. Overall then, a thumbs-up for me for this Indian. 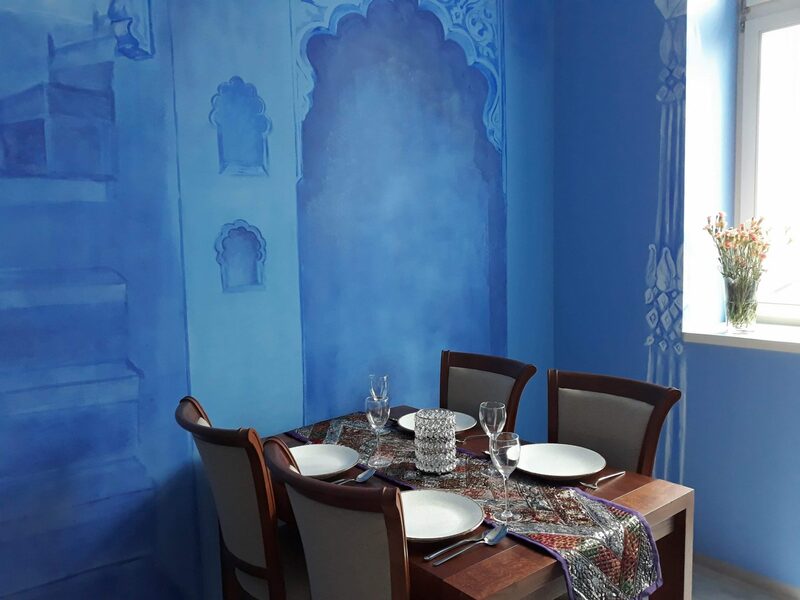 It’s not the finished article, and it still isn’t the Indian restaurant that Krakow has been waiting for to really rival any most UK expats have in their small hometown, but it’s promising and will improve.